This week we’re happy to welcome Dr. Steve Salisbury (@implexidens) to Real Scientists! Steve Salisbury runs the Vertebrate Palaeontology & Biomec hanics Lab at the University of Queensland, Australia. 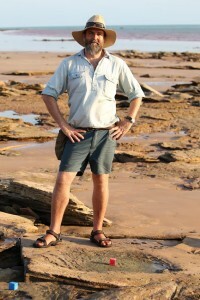 Steve and his group does research on the evolution of dinosaurs, crocodilians and other prehistoric animals from Australia and around the world. You can read more about Steve and his lab on their website. Here is Steve’s story. From as long as I can remember I’ve been interested in the natural world, in particular rocks and fossils, and always dinosaurs. I feel like adult version of a little kid who is obsessed with dinosaurs. Maybe I just never grew up! Growing up in the Blue Mountains, west of Sydney, I was always in the bush, collecting things, watching animals and learning about plants. I was always collected bones, rocks and anything else I thought was interesting. As I got older I carried this curiosity through to high school, university and now into my career as a professional palaeontologist. I feel very lucky and privileged to be doing what I do. How many adults can say they have a job that is the envy of every second six year old! Why did you choose your current field/what keeps you there? As soon as I worked out what a palaeontologist was! I am still in awe of dinosaurs and other extinct creatures, and love trying to piece together aspects of their world and what they looked like from clues in the rocks. It’s like being a time traveller, but the travel happens in your mind and relies on what you can find and make sense of in the natural world around you. It’s great fun. I also enjoy the fieldwork component of palaeontology. I love getting out to wild and remote places, searching for things and using a mix of traditional and hi-tech. One minute I might be cleaning a dinosaur track with a $2 scrubbing brush talking about Dreamtime stories of the Emu Man with Traditional Custodians, the next I’ll be flying over the same track with a drone, viewing through an app on my smart phone as we photography for the creation of digital 3D models. There aren’t many sciences where those two worlds come together on a regular basis. My job is a mix of teaching and research. I teach undergraduate courses on evolution and the fossil record, the biology and ecology of Australian plants and animals, climate change and human evolution. I also have a lab with a research assistant, post doc, and several PhD and Honours students. Our research is mainly focused dinosaurs and crocodilains, paricularly those from Australia and other Gondwanan landmass. We do fieldwork in Queensland, Western Australia, New Zealand and Antarctica. At the moment we are tracking dinosaurs on the Dampier Peninsula in Western Austraila’s Kimberley. Lots of people love and are interested in dinosaurs and fossils, and this is a great way to get them involved in science. Many people probably love reading about dinosaurs and their world themselves or maybe with their kids, are inthralled by the latest dinosaur block-buster or get excited by the exciting exhibitions in their local museum. But what they often don’t realise is that all those things require palaeontologists, out there looking for stuff, doing science, and making sense of fragmented clues from worlds long gone. I love being part of that process and sharing what I do with the public. At present I am helping with the Dinosaur Coast Managment Group. The DCMG was formed in 2015 in Broome as a not for profit community organisation. 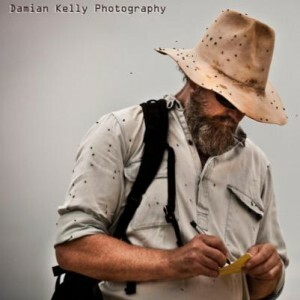 The group was established to help educate and inform the public about the cultural, scientific and historical significance of the dinosaur tracks of the Dampier Peninsula, and to guide their ongoing management and promotion. Members are an exciting mix of scientists, traditional custodians and community members, with representatives from The University of Queensland, Flinders University, CSIRO, Nyamba Buru Yawuru, Goolarabooloo Millibinyarri lndigenous Corporation, Roebuck Bay Working Group and Environs Kimberley. The Department of Parks and Wildlife and Yawuru/Parks and Wildlife Joint Management team also have nominated representatives. We are very busy at the moment! Extracurricular Activities? Rock climbing, surfing, skatebaording, bush foods, and just hanging out with my two kids. I also have a bit of thing for kites. Ideal Day Off? Day off? Please welcome Steve to Real Scientists!